© Provided by CNBC LLC Test house at the Insurance Institute for Business and Home Safety. It is impossible to build a fully fireproof home, but researchers are now focused on making homes at least fire resistant. They have to, because climate change is increasing the intensity of wildfires around the world, putting billions of dollars' worth of real estate literally in the line of fire. "There is no reason to think they are going to get better," said Roy Wright, CEO of the Insurance Institute for Business and Home Safety. "You look at this kind of impact — the variations in the climate we have had, we are far more susceptible to the size and intensity of fires." Roughly 14,000 homes burned to the ground in just two of the enormous California wildfires last year. Wildfire damage to both residential and commercial property in California alone last year totaled nearly $19 billion, according to CoreLogic. The rainy season in California is getting shorter and the droughts more prolonged, meaning there is simply more combustible material and more opportunity for wildfires. "There are steps that we can take so that the impact of that fire is narrowed, it doesn't spread as far, and it impacts far fewer structures," said Wright. 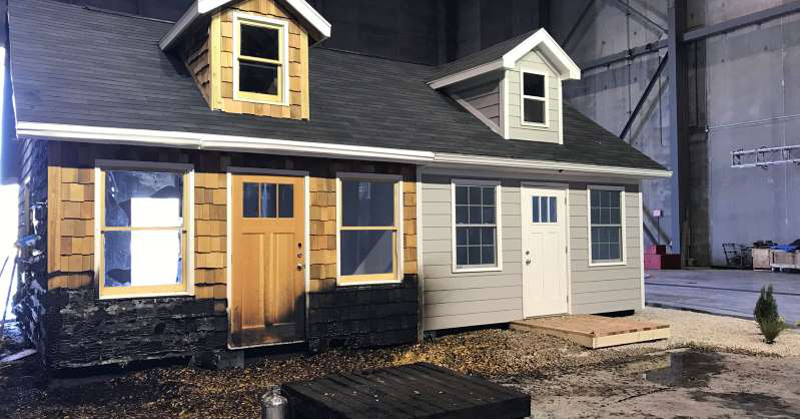 The IBHS built two test homes at its facility in Richburg, SC, one a typical structure, the other using fire-resistant materials and landscaping. Using large fans and ember generators, it showed how quickly one house erupted in flames, while the other did not. Though a wildfire's wall of flame might look most destructive, 90 percent of fires are ignited by flying embers, some the size of a human hand. "Fire resistance means you've incorporated building materials and design features that will get the ember exposure, will get the fire exposure, but would resist it," said Daniel Gorham, research engineer with the Insurance Institute for Building and Home Safety. The landscaping was also key. The typical home had mulch, the fire-resistant home, rocks. The fire resistant home also had all its plantings at least five feet from the siding and the siding was raised six inches off the ground. "We have non-combustible landscaping. In this case, we have rock mulch from zero to five feet away from the building. We also have the ornamental vegetation outside of that five foot zone, and spaced strategically," said Gorham. Satellites have captured embers flying up to seven miles from a wildfire. These start secondary fires. The embers can land in gutters and siding and smolder for up to 12 hours before they ignite. Using metal instead of vinyl gutters mitigates fire risk: vinyl can melt and drop fire onto the side of the house - metal will not. "We have a dual-paned, tempered glass window, and we have a fiber glass door. Dual-paned is important because if we do get a fire here, single-paned glass would break, and then we have a window break, we now have a breach in the opening and that's when flames and embers can get into the home," said Gorham. While the cost to real estate from wildfires is rising, the cost to build and landscape a fire-proof home is actually the same or slightly less than the cost of a typical home. The savings is in the cement siding, cheaper than wood materials. That offsets cost increases in gutters and vents. 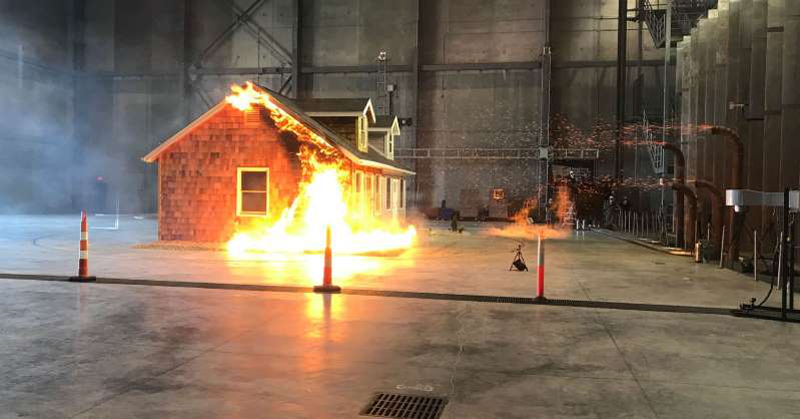 In the Insurance Institute's experiment, with equal amounts of embers blowing on them, the fire resistant home did not burn at all, while the typical home, which was connected to it, was fully engulfed. "This work that we do here in the lab, this is real. I think all too often, we can watch something on TV, we can listen to it and go, "That's interesting. But it won't happen to me." But it does. It invades a family's life," said Wright. Wright is a former FEMA official and native Californian. His parents lost their home in California's Camp fire last year, the worst in the state's history. "I've always led my team saying, 'Make sure we know the names of those people,' but when that fire came through Paradise-- and you get the text message from your mom that says, 'Our home is gone. Where do I start? '…the nature of how destructive it is hits home," said Wright.